Sandpiper AODD Containment Duty Metallic and Non-Metallic Pumps are ideal for highly corrosive and hazardous chemical fluid requirements. 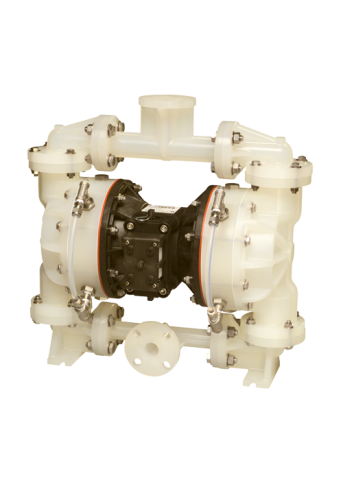 All containment duty pumps are exclusively designed with containment chambers, hydraulically balanced/coupled pumping diaphragm and driver diaphragm assemblies. All containment chambers are designed to accommodate visual, mechanical and low voltage leak detection devices. CD pumps are constructed of Aluminum, Cast Iron, Stainless Steel, Alloy C, Polypropylene and PVDF with TPE (thermal plastic elastomers), PTFE options in diaphragms and check valves. Suction / Discharge Port Sizes: 1" through 3"